I never thought I would be writing a letter like this to you, but I couldn't put it off any longer. I might as well get to the point - I think we should break up. It's not you, it's me. I think now we just want different things, and well, I think it's best for both of us. I look back and think about all the great times that we had together. In the beginning of course, I never intended for us to get together. I was fairly happy with my TX5 - we had been together for 2 years by then - but I guess I always thought there might be someone else out there a little better. And when I saw a picture of you, it was love at first sight. I heard of other people who found their desires overseas, but I never thought I would like a Japanese girl. I remember like it was yesterday the day you arrived on the dock. Sleek body, great rear end, the way you whistled quietly when you really came on boost, and your twin airbags. It was the start of something great. We did everything together, and I fell in love. But not everything is perfect. We had our ups and downs like every relationship does. I remember the time you got that little misfire. You told me no one else had driven you, but I was never really sure. Where else could you have caught it from? But I never wavered; I never thought there was anyone else. You were the envy of all my friends. Everyone wished they had you, and you knew it! I remember the smiles and waves as we went down the street, and you know I liked the attention you got... but it started to get to be a little too much. Over time, I think our priorities changed. You wanted to party, mix it up late into the night, and I wanted to cruise down to Philip Island for a quiet weekend away. I think I started wanting someone a little more practical. I guess the problem lies with me though. Temptation is hard, and I succumbed. With my new job, I got to do lots of different things. There was that fling with the MX5 Turbo, HSV Coupe, TS50 Tickford, oh and that cute little European girl, the Barina SRi . I showed weakness, but you forgave me. Forgiving me showed strength, and I admire you for that. I guess that was the catalyst for what I have to do now. My eyes were opened to the possibilities of another; maybe I needed someone different? So now I have no choice but to say goodbye. I can say with all my heart that I enjoyed our times together. We cruised the streets, holidayed, and went to the races together. Now, I just hope you find someone to pamper you the way I did. Thanks for the great times and the memories. Look after yourself, and keep up that 98 Octane, it seems to be doing you well. OK, so maybe I didn't write a letter to my car telling it that I loved it and I needed a change, but that is how I feel at the moment. I am a little sad! I imported my Skyline from Japan myself when I was running a little side business importing vehicles from Japan. At the time I owned a modified TX5 2.2-litre turbo, and although it went quite well in a straight line, braking was average, and you could nearly scrape the doorhandles on the road if you cornered hard. The suspension was 10 years old, and getting tired. But even with all of that, at that stage I wasn't looking for a new car. To cut a long story short, one day my agent in Japan notified me that he had a 'really nice' Nissan GTS25t Skyline and asked - had I any potential clients? I couldn't find one, but then thought I should buy it myself. Why not? I had driven a few Skylines on short trips and they seemed pretty good. What the hell... I rang the bank, organised a small loan, went through the usual import process (which took about 2 months to see the car arrive in Australia), and got it complied and registered. Total on-road purchase cost two and a half years ago was AUD$22,000. A bargain in performance terms; even better considering car yards and importers were advertising them at the time for AUD$30,000. Wow. What a car. Power, speed, handling, braking, a nice double-din sized Sony stereo and only a couple of minor panel marks. Insurance was a killer, AUD$2000 per year or thereabouts, but I loved the car. Within months it saw its first run at Sandown raceway in Melbourne, and lapped over 8 seconds quicker than my modified TX5 turbo did, and did it easily, too. I loved driving this car every day. Such awesome torque and drivability. And no matter which car I got to drive in my job, I still drove my car home with a smile and a lot of respect. So what made me sell when I still miss it? I guess some people may think I am a little bit strange. It ain't a GT-R, but it is still a pretty desirable vehicle. There was nothing wrong with it really. It had the odd small niggle, some suspension knocking beginning to appear, the odd hesitation due to poor fuel, but generally it made me smile every time I drove it. However the concerns I have about import ownership were minor issues to me years ago, but not any more. I have noticed a large increase in the number of reports of vehicles like mine being stolen during, or some time after, test drives. Insurance is expensive, and not easy to get. Two doors ain't practical either - or the tiny boot space. Would you like leaving your Skyline in a shopping centre car park, at risk of being stolen? Nope, neither did I, so I couldn't even use it as much as I would have liked. But someone I knew who had always liked the car wanted to buy it, and had the money. No test drive dramas, no advertising costs and waiting for months and months to find a buyer at the right price. I didn't have to worry about tyre kickers thrashing my car on a test drive. And I would be able to sell it for AUD$20,000, no haggling. And what about my experience of driving a grey market import? 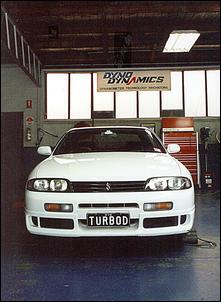 (This model Skyline was never sold new in Australia.) The first thing to consider is how much the car will depreciate. The answer: usually heaps. And it's a niche vehicle. You may love it and yes, it might be great value and a fantastic performer but how big is the market for them? Will it take you 6 months to find a buyer? I have lost count of the number of similar grey market Silvias and 180SXs driving around with big 'FOR SALE' stickers on the window... Will the buyer be able to afford rising insurance premiums for imports? Do you want to go through the rigmarole of test driving with strangers who could be casing the car or your house? Not me, thank you very much. I will take the safer road, the higher ground. Lease a new, factory delivered vehicle. It may not have the performance of the Skyline, the 'street cred', or make me smile as often, but I'd rather not have the 'import worries', thanks.